Many Disney enthusiasts take time out during their Disneyland Park visits to stand below the fire station, paying their respects to Walt Disney by stopping to view the eternal lamp in the his apartment window. 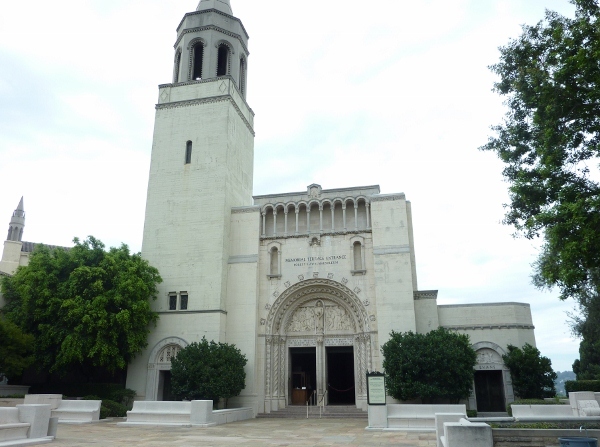 However, many feel personally led to visit his final resting place in Glendale, California’s Forest Lawn Memorial Park. I recently made my first journey to see his gravesite, even though I have lived within mere miles of it for many years. What I found there was an understanding of why many of the elite choose this for their memorial home. The beauty and grace is certainly worthy of reflection on lives that have been well-lived. If paying your respects at Walt Disney’s grave site is something you’ve considered including as a part of your unique Southern California experience, I wanted to provide a guide to making your visit a serene and enjoyable one. There’s always a bit of awkwardness on discussing cemeteries, much less planning a visit to one. After all, many people don’t have the experience of visiting gravesites, anymore. As a child, Sunday visits were part of our family’s routine. I was raised with the solemnity of the occasion, as well as a “familiarity” of the peace that could be found there. My regular readers will know that I’m always up for giving you facts and opinions that will hopefully help you make the most from this experience – no matter how unusual the subject is. I just don’t want you to miss out on something that will possibly be one of the most memorable parts of your visit, because of that “taboo” uncertainty. Without hesitation, let’s get started. 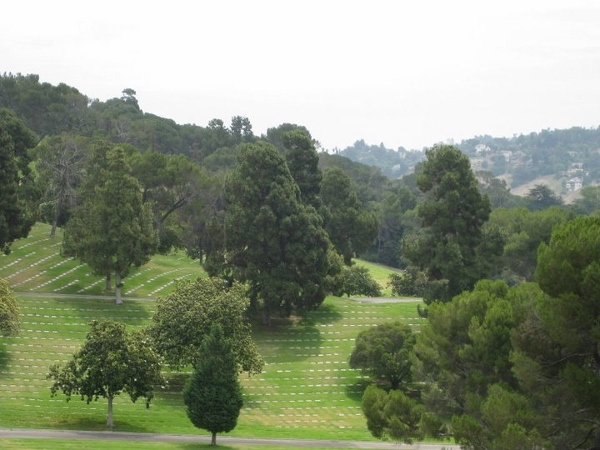 Forest Lawn isn’t just a cemetery. It fits its nombre of Memorial Garden in every aspect. Originally developed in the early 1900s, it quickly became one of the most progressive cemeteries of its day – permanently changing the business aspects of American cemeteries through its example. Fate brought a man named Hubert Eaton to become its president in 1916. 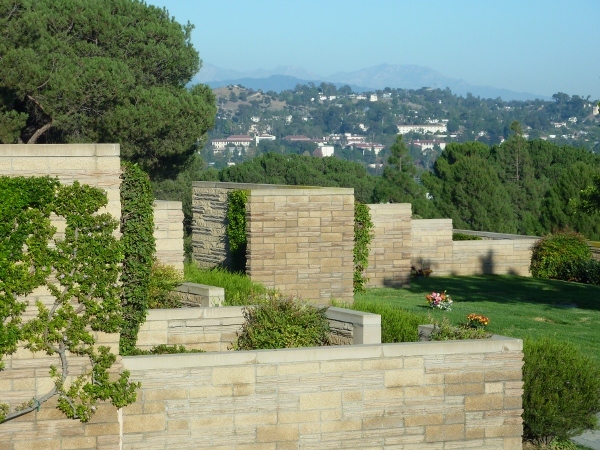 Eaton’s vision, and the fact that Forest Lawn has continued to hold firm to Eaton’s famous Builder’s Creed, has turned the concept of a cemetery from that of crumbling tombstones to a true “garden” of peace. You see the difference at the entrance to the park. 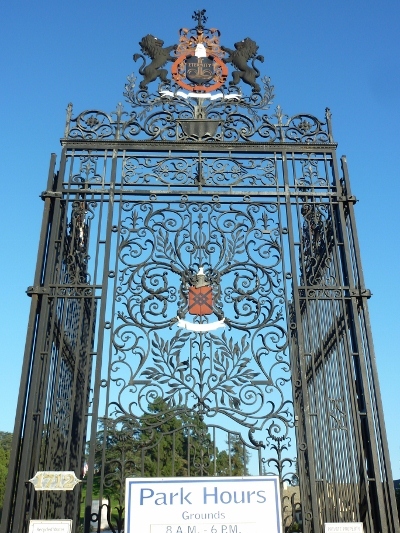 When you pass through the wrought iron gates (documented to be the world’s largest), you get a sense of the dignity and grandeur that awaits. TIP: Park hours are between 8:00 am and 6:00 pm, while certain areas of the park have more specific hours. Time of day is not important in visiting Forest Lawn, but if you plan on viewing two of the main exhibits, be advised that they have specific presentation times. Before you reach the security booth, look to the left, and maybe even pull into the parking spots that are immediately available. 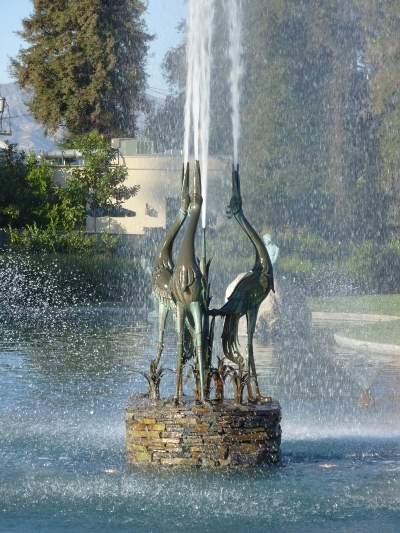 Here you will see the Park’s signature heron fountain. 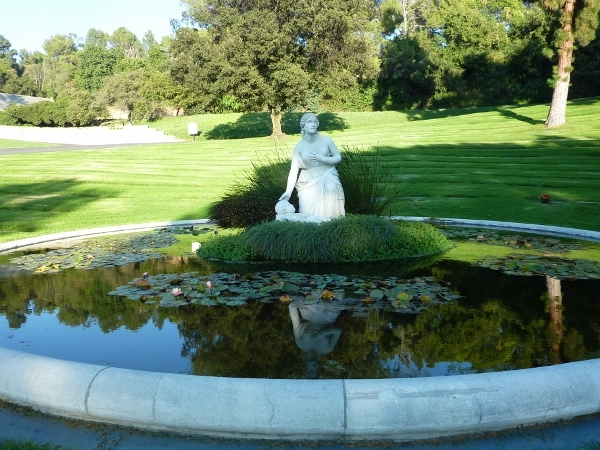 This beautiful fountain also serves as Forest Lawn’s signature icon. If you look closely, you can almost see the rainbow that the fountain spray creates. 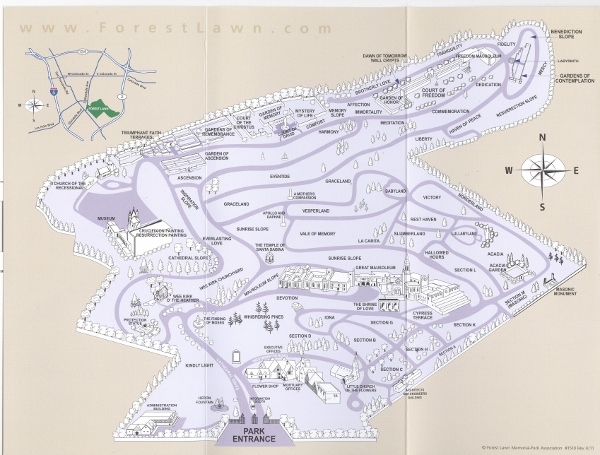 When you check in with the security guards, please ask them for a map. The 10 miles of roads in Forest Lawn bend and twist as they traverse through the hillside and it’s easy to get turned around. TIP: By policy, the Forest Lawn staff are not allowed to disclose the location of any of their patrons – especially the more famous ones. Please do not ask or expect them to tell you where a gravesite is. If you are looking to visit specific memorials, you should do your research before your visit. If you are inclined to leave a token in memorium, the Floral Shop is in the Administration Building, just to the right. Single stem flowers can be purchased for as little as $2.00 for gebera daisies and as much as $5.00 for a single rose. There are several other items here as well, including statues, jewelry, and religious meditation items. Disney fans might recognize the exterior of the Administration Building from one of Disney’s unique live-action films, starring Jodie Foster – Candleshoe! Also next to the Flower Shop is a large tablet, marking the path to their most cherished places. It also serves as a reminder for basic courtesies. Please heed these instructions, as this is primarily a place of respect. As you drive through the grounds, you notice the difference in feel of this garden, as well as get a glimpse of the treasures to be found. 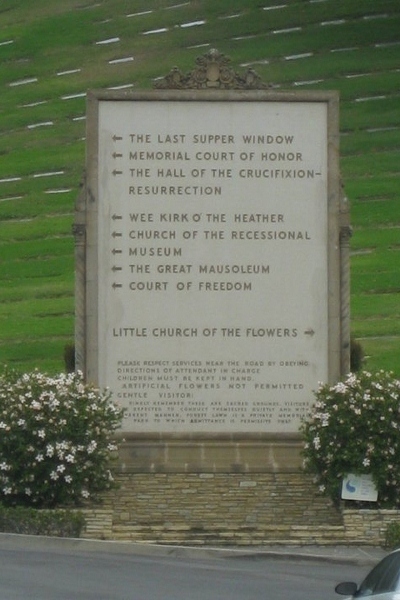 Forest Lawn was the first to eliminate traditional tombstones and grave markers, in order to establish a park-like appearance. It was also the first to position works of art that celebrated life and was not the sorrowful sculpture that is most commonly associated with cemeteries. One of the first “planned sculptures” you pass is the white marble The Finding of Moses by Brazza – copied directly from the original in the Pincio Garden of Rome- and installed in 1926. 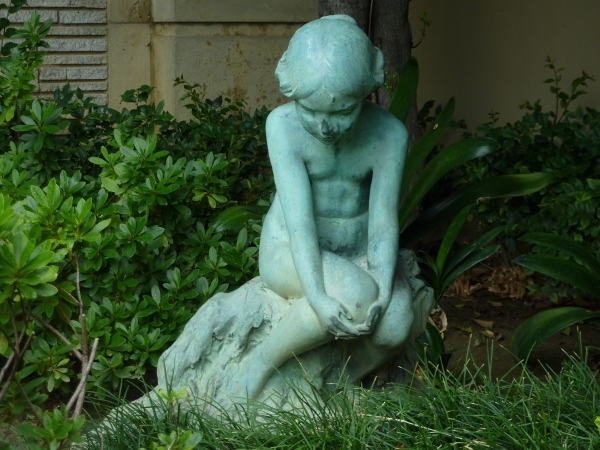 In the 1920s, Forest Lawn cultivated a long-standing relationship with the Ministry of Fine Arts of Italy that has proven to be extremely beneficial to the Memorial Park. 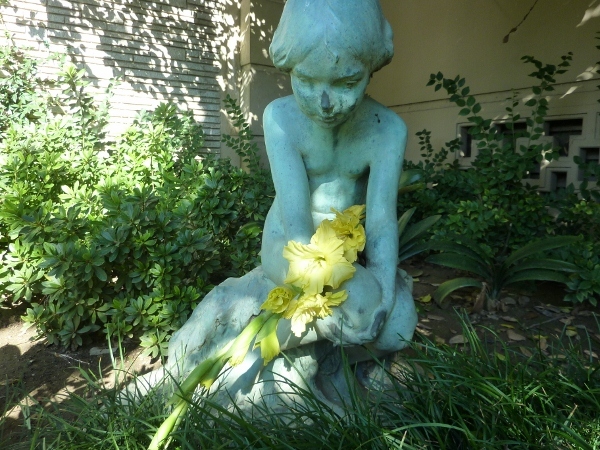 There are over 1,000 sculptures gracing the six Forest Lawn properties. As you climb toward (what I recommend to be) your first destination, you come across the second church built in Forest Lawn – the Wee Kirk o’ the Heather. 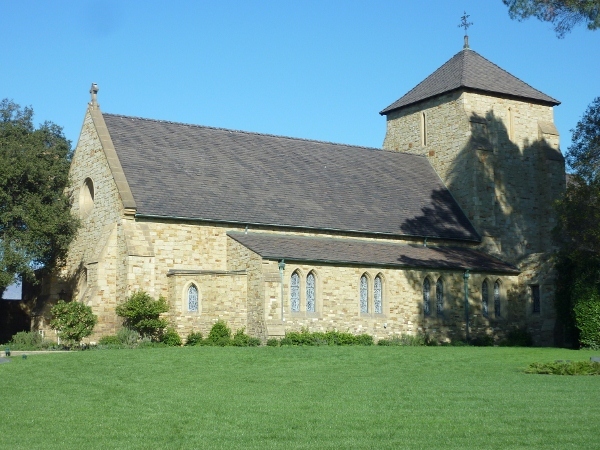 This church, dedicated in 1929, is modeled after the village church in Glencairn, Scotland. 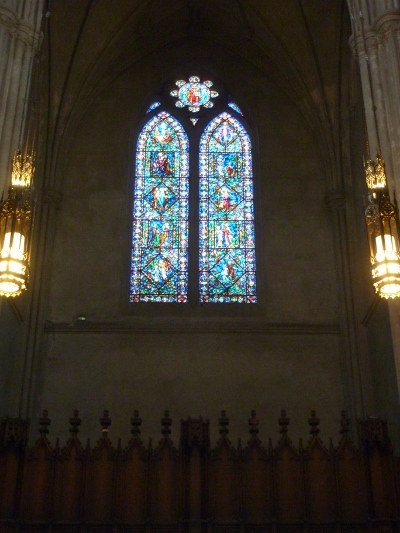 The windows are all based on a famous Scottish love song about a Scottish aristocrat’s daughter named “Annie Laurie”. The historical room inside has many of Annie’s personal artifacts. 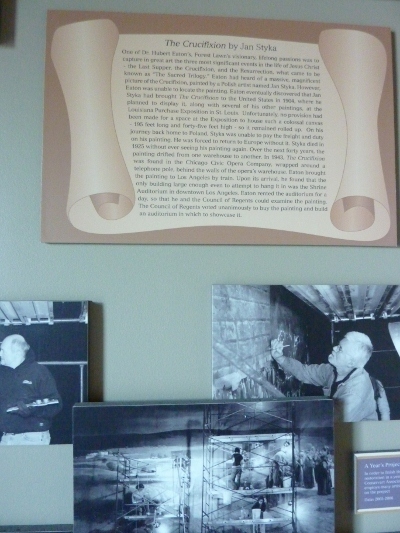 Each of the 3 Forest Lawn churches has its own unique historical room, dedicated to its inspiration. Some trivia - Ronald Reagan and Jane Wyman were married here in 1940, and frankly, after seeing the charm of these churches, I would have gotten married here, too! 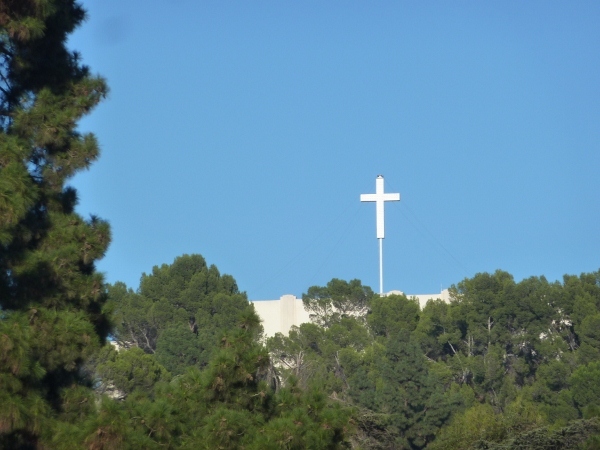 If you are planning on taking in all that Forest Lawn has to offer, The Hall of the Crucifixion and Resurrection (built in the 1940s and dedicated in 1951) and the Forest Lawn Museum (opened in 1952) are the first places I recommend touring. Allow about an hour to experience this area, as there are several exhibits that require at least a 25 minute block of time. Let’s talk about the first one. The Hall of Crucifixion-Resurrection hosts some amazing stained glass windows over the transition wall from the cathedral building into the main hall. These stained glass pieces are only a small part of what is considered to be the largest single collection of stained glass in the United States. 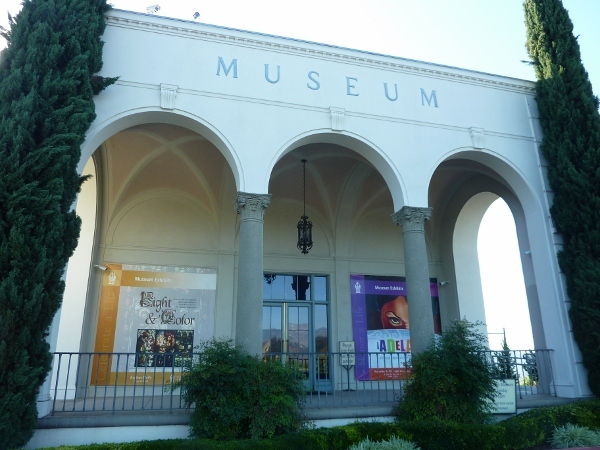 The buildings host several pieces that were custom-made in Italy for Forest Lawn, as well as several historical pieces that were acquired from Europe. In the narthex of the cathedral portion of the building, you will find a pictorial exhibit about the heart of the Hall – the painting “The Crucifixion” by Jan Styka. This massive masterpiece was painted at the end of the 19th century and displayed throughout Europe. It was brought to the United States for display at the 1904 World’s Fair, but ended up not being displayed. The painting’s story tells of tragedy – as it was unable to be taken with Styka back to Poland and was almost lost in the United States. Hubert Eaton launched a massive search for the missing artwork, and once found, brought it to Los Angeles to be restored and built a massive Hall that can be seen from the freeway, to make sure this treasure was displayed in proper fashion. What makes this painting worth all this? It’s 195 feet long and 45 feet high! This massive painting is viewed in a 25 minute multi-media presentation that really showcases its details. No matter what religious views you profess, the presentation is done in a style respectful of all viewers. It tells the story and meanings behind the painting, as well as that behind the story of the second grand work of art displayed – The Resurrection by Robert Clark, and influenced by Eaton, is 75 feet wide and and 51 feet high. I enjoyed hearing the stories and interpretations of each piece and the 25 minutes flew quickly by. TIP: The Crucifixion-Resurrection exhibit is shown on Tuesday through Sunday, every hour, on the hour, from 10:00 am to 12:00 pm, and again from 2:00 pm to 4:00 pm. If this viewing interests you, make sure you time your visit accordingly. 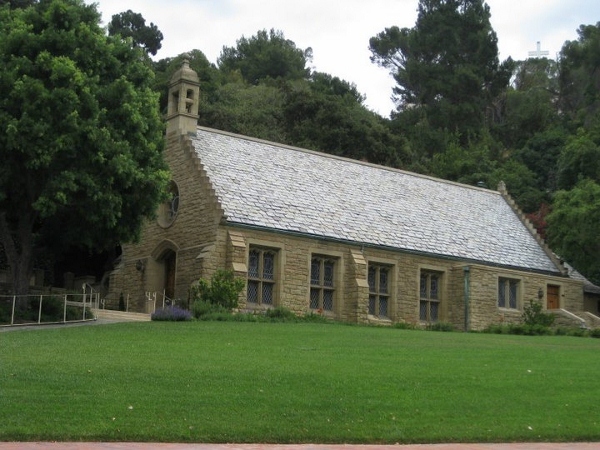 Next door to the Hall is the Forest Lawn Museum, which houses a permanent collection of unique bronzes, stained glass, paintings, and artifacts, as well as temporary art exhibits and a gift shop. I enjoyed wandering through this exhibit and even came home with a paperback history of the Memorial Park! While I couldn’t take photographs inside the museum, I could pull out my cell phone and use it to hear an audio guide to some of the exhibits. You could actually do it from home, if you wanted to get a taste of what is inside! TIP: The phone number for the Museum Audio Tour is 323-209-4143. Just touch a number and then # to hear the description. For instance, #1 tells you about the direct cast reproduction of the famous Paradise Doors in the Baptistery of St. John in Florence, Italy – made by the man who restored Ghiberti’s original doors in the mid 1900s. The active audio is contained in most numbered selections from 1 to 24. Besides the cast of Ghiberti’s doors, there are a large collection of American bronzes – including Frederick Remington’s Bronco Busters(4#), medieval stained glass windows(9#, 10#), and Henry – an actual Rapa Nui/Easter Island moai (8#). There are a wealth of other pieces in the collection for you to enjoy at your own pace. 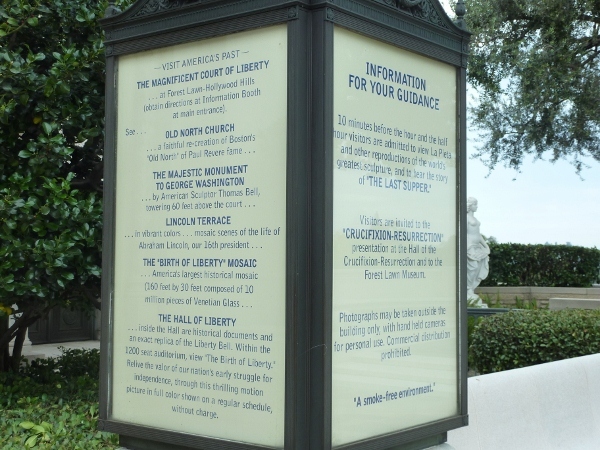 As you tour various buildings and gardens of the park, many of the famed marble sculptures, such as The Mystery of Life and The Court of Freedom, are on the “tour”. In fact, I’m enjoying them by audio now while writing this! When you exit the museum, make sure you walk over to the wall and take in the view of the valley below. 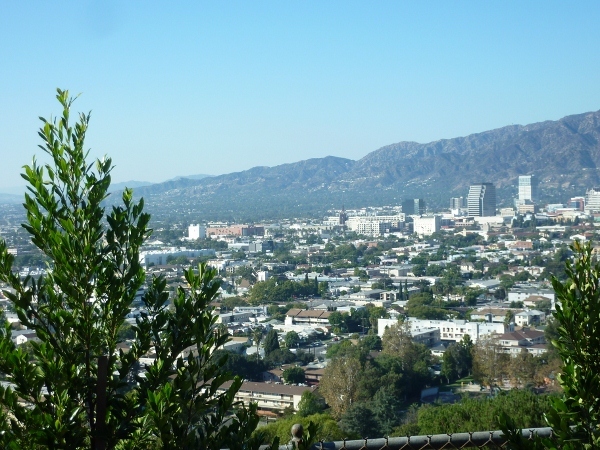 You will get a wonderful glimpse of Glendale and Burbank beyond. Across from the museum, is the Church of the Resurrection. This is the 3rd church to be added to the property in 1941. It is modeled after the 900+ year old Church of St. Margaret in Rottingdean, Sussex, England, where Rudyard Kipling was a parishioner. Inside, you’ll find the Kipling Historical Room with mementos and bronze sculpture, and outside, several of his poems are inscribed in stone. Winding back down the hill, you can’t help but notice the picturesque nature of Forest Lawn. Every bit of landscaping seems so purposeful. As we’ve toured so far, you can’t help but notice the grave markers are all plaques that are flush with the ground, so that the eye is drawn to the curves of the slopes and specially placed statuary – like the Moses Pool or the angel seen below. 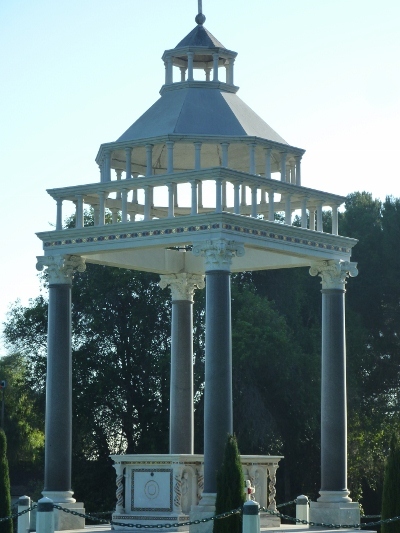 Forest Lawn was the first cemetery to require this style of burial marker for almost all of its patrons, in order to provide a park-like atmosphere. This was a controversial decision in 1917, but paid off in the long run. Eaton’s reasoning is forever carved in stone in front of Forest Lawn’s Grand Mausoleum. 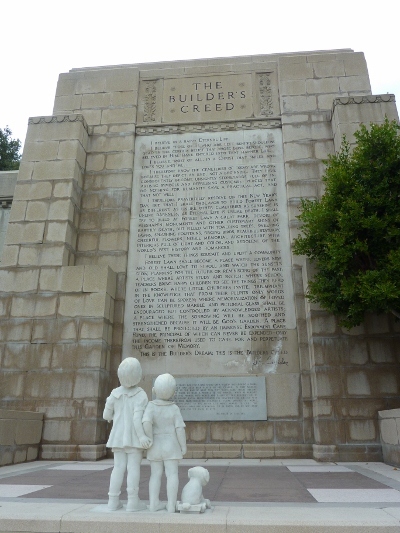 Eaton had a firm belief in his vision of what a Memorial Park should be and Forest Lawn literature notes that they still hold The Builder’s Creed in practice to this day – possibly one of the very first “corporate mission statements”! The Grand Mausoleum is a perfect second stop if you only have a portion of the day. Inside are direct cast replicas of most of the famed works of Michelangelo, including several pieces from the Medici Chapel and even La Pieta. 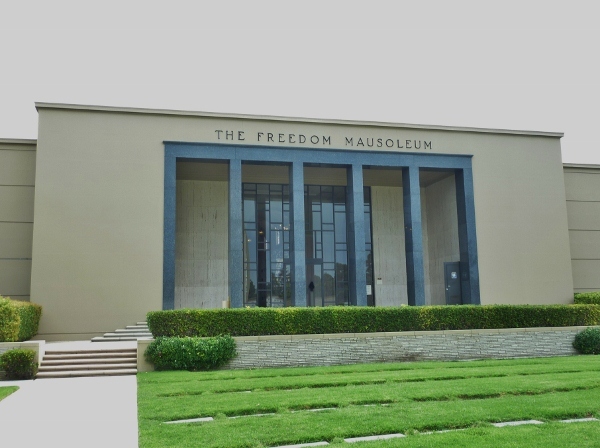 TIP: No photography is allowed inside the Mausoleums, due to privacy policies. No need to worry. The memory of the interior of this building and its artistic endeavor will stay with you for quite some time after leaving. Also, many of the mausoleum areas have simple ropes across the entrances. While you are allowed to wander through most of the main floor, admittance beyond the ropes is only for those with proof of interred relations. Please do not cross these barriers. This Gothic building is home to the second multimedia presentation – a stained glass recreation of the original The Last Supper fresco by Rosa Caselli Moretti. The documented colors of the original sketches, as opposed to the ones used in the restorations. This presentation is held in a Gothic great hall with vaulted ceilings and the piece is lit with natural light. This means that the stained glass takes on entirely new characteristics at different times of day. TIP: The Last Supper is shown every hour and half hour between 9:30 am and 4:00 pm, 7 days a week. Plan your visit accordingly. 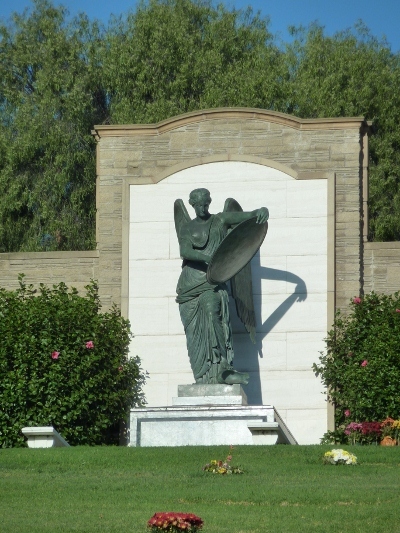 Outside of the Memorial Terrace entrance to the Great Mausoleum, you will find an information guide to sights within Forest Lawn’s Glendale location, as well as its Hollywood Hills one, based on your personal interest. Once you leave the Great Mausoleum, it is time to finally head up to the Court of Freedom. This area is of special interest to Walt Disney fans, as he was noted for his patriotic spirit. On the way, you will pass a few items of note. The first is the Temple of Santa Sabina, from the 5th century Basilica in Rome. 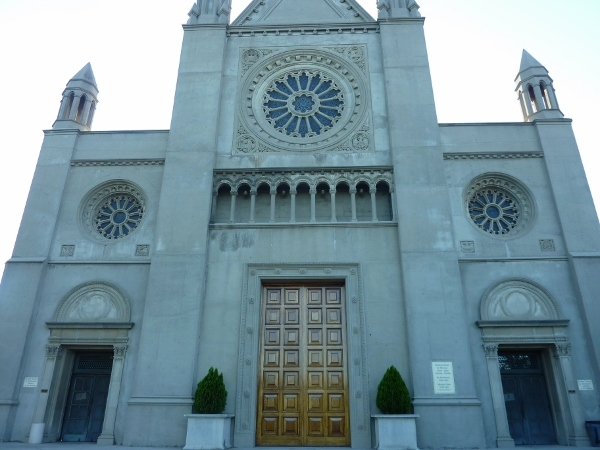 When the basilica was remodeled in the 1920′s and 1930′s, the Temple was purchased to save it from destruction. With such notable history of being a planning place for Napoleon’s campaigns, it seemed only fitting that it sits at a crossroads on a hill. The road then takes you up to several important statues and the Court of David – a reproduction of Michelangelo’s masterpiece. 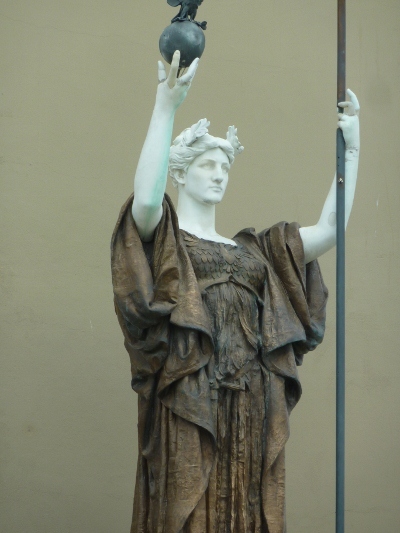 This is the 3rd statue of its kind – the other two were lost to earthquakes. 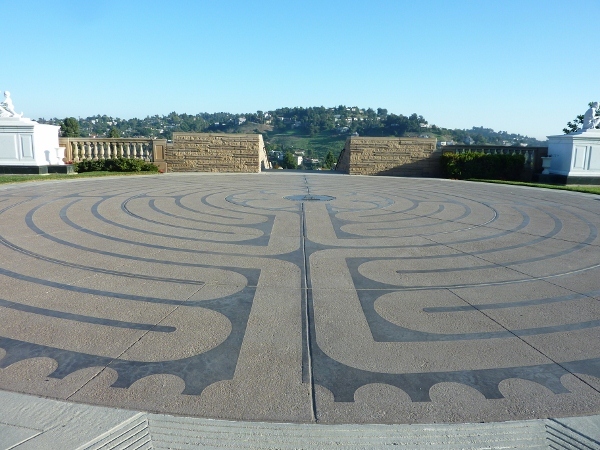 When you reach the highest point at Forest Lawn, just past the Court of Freedom, you pass over a replica of the Labyrinth that resides in the Chartes Cathedral in France. This labyrinth is used for what is known as “walking meditation” – following the path as it winds in its circular fashion. TIP: If you have time, start at the outside and slowly walk the path to the center. This is a meditation practiced by medieval monks and produces some surprisingly serene results. The Labyrinth also hosts a view of the functional terracing architecture that separates many of the hillside plots into small peaceful “gardens”. Two of the many sculptures that celebrate life are also found here. 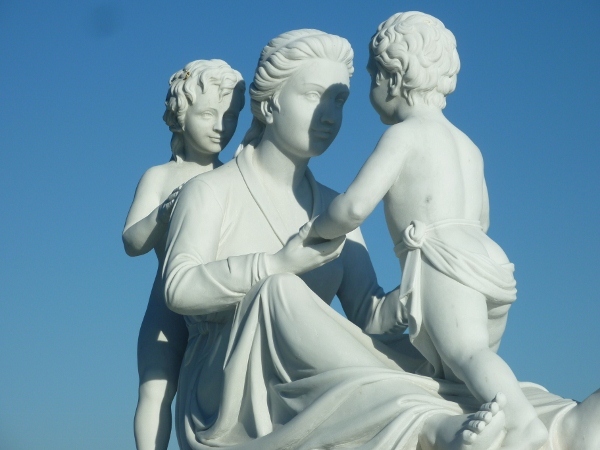 This is one of a pair of matching marble depictions of the joy shared by a mother and her children. 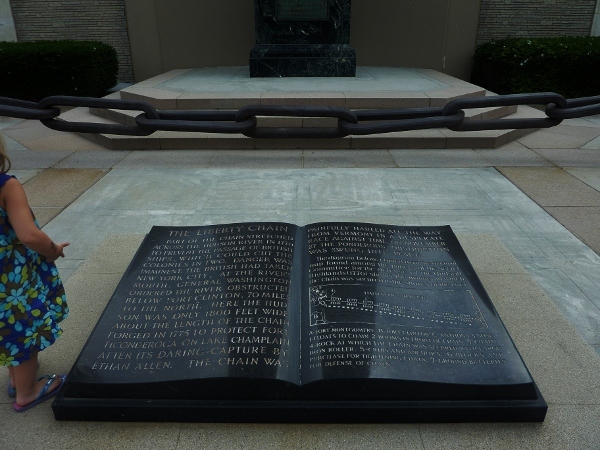 The only memorial sites allowed to have larger “monument” pieces, such as these, are ones that contain more than 8 plots. 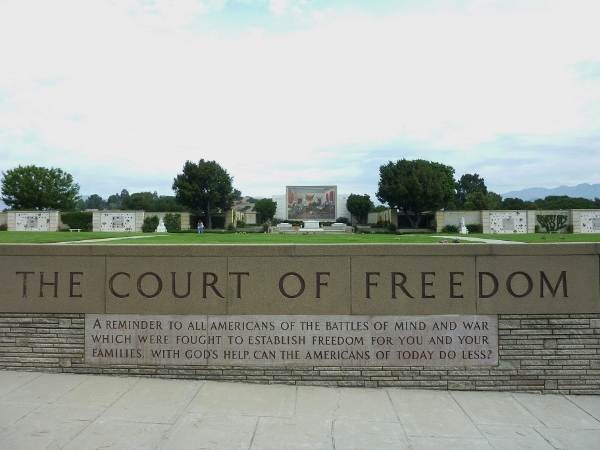 Next to the Labyrinth is the Court of Freedom and The Freedom Mausoleum -honoring the sacrifices our forefathers made to ensure our nation’s freedom. Points of interest include a mosaic of Trumbell’s famous painting Signing of the Declaration of Independence, which is in the Capitol Rotunda in Washington, D.C., as well as two famed patriotic sculptures. The Republic was sculpted by Daniel Chester French, known for the famed statue in Washington, D.C.’s Lincoln Memorial. The other statue is John Quincy Adams Ward’s statue of George Washington - commissioned by the U.S. Congress without the funds to pay for it. 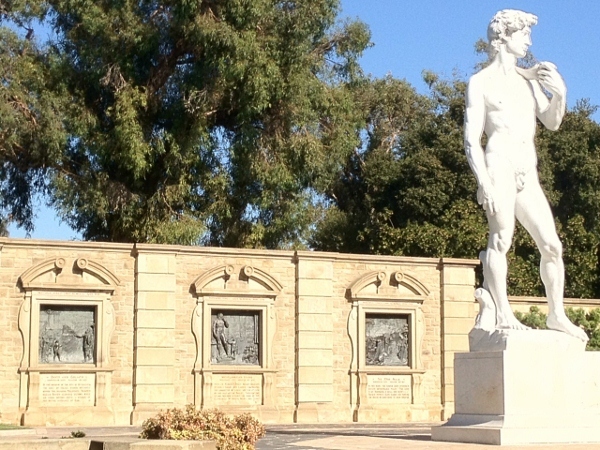 Congress’s loss was Forest Lawn’s sculptural gain! 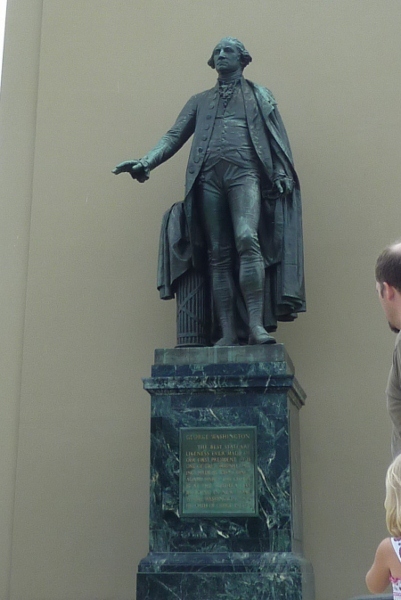 Beneath George’s pedestal lies a unique “sculpture” with unique historical, though undocumented, origins. It is rumored that these seven links of this iron Liberty Chain are actually from the same chain that General Washington used to secure the Hudson River in 1776. There is no proof for or against this claim, but the drawings, etched into the book below, show the secret plans for the mechanism that raised and lowered the chain. The emotion of the Court of Freedom brings us back full circle to why we came in the first place – to honor the man whose creative vision has brought us all together. Simply put, if it weren’t for Walt Disney, I wouldn’t be writing this piece, and you wouldn’t be reading it. This one man has brought us all together and made us a part of each other’s lives with his zest for life and his desire to bring families together through the joy of entertainment. As I sat before the Little Mermaid statue that marks Walt Disney’s memorial site, I thanked this man for all of the joy and blessings that he unknowingly has brought into my life and the life of those around me. If there is any way of experiencing a momentary connection to the life beyond this one, the serenity and, dare I say “joy,” of being at Forest Lawn is truly the medium to allow this to happen. Photos by N. Johnson and N. Mancini. When is paying $100 for a meal a good deal?